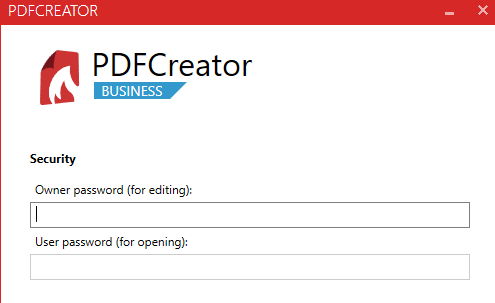 PDFCreator ignores settings in "Security"
I'm trying to create an encrypted PDF file. For that, I created a separate profile that's supposed to do that, with needed options in "Security" checked (password required for editing and opening). However, upon selecting the profile, when I'm clicking "Save" the program is not asking me for the encryption password, and just saves an unencrypted document instead. Same outcome happens when I input both passwords in profile's settings - they just get ignored. Whether I'm using the "Convert with PDFCreator" option in the context menu, or printing the file using PDFCreator's printer, the outcome is still the same. Running latest version of PDFCreator (3.3.2) on Windows 7 64-bit. Any advice? Thank you for your message. I am trying to replicate the issue just now on my machine and I will be back to you with answer / explanation shortly. Are you using PDFCreator Free? I might want/need to test this as well. Please try to export your current settings and restore PDFCreator to default settings. Create a new profile with the same config as above. Alternatively you might want to do fresh installation of PDFCreator. Please let us know the outcome. Thank you. Hey, thanks for the advice, restoring PDFCreator to default settings helped. Whenever I'm going to be changing any settings, I'll test if encryption still works, and if I do find a change that causes the issue to reappear, I'll let you know.